Draw a line segment of length 8 cm and divide it internally in the radio 4:5. 1. 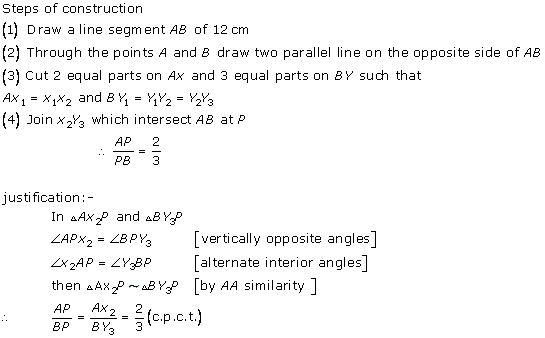 Draw segment AB of length 8 cm. 2. Draw any ray AX making acute angle ∠BAX with AB. 3. Draw BY parallel to AX by making ∠ABY = ∠BAX. 5. Join A4B5; it intersects AB at P. P divides AB in the ratio 4:5. Draw a ∆ ABC in which base BC = 6cm, AB = 5 cm and ∠ABC = 60o. 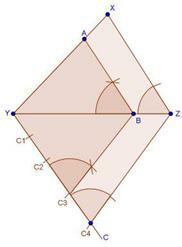 Then construct another triangle whose sides are of the corresponding sides of ∆ABC. 1. Draw ∆ABC with base BC = 6cm, AB = 5 cm and∠ABC = 60˚. 2. Draw any ray BX making acute angle ∠ABX with BC. 3. Mark four points B1, B2,B3,B4 on BY such that BB1=B1B2=B2B3=B3B4. 4. Join CB4 and draw a line parallel to CB4, through B3, to intersect AC at C'. 5. 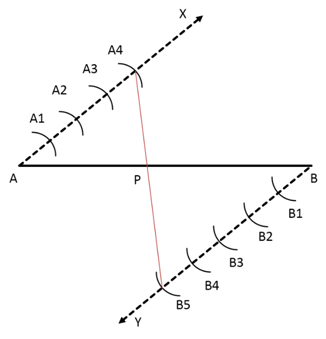 Join AC, and draw a line parallel to AC, through C', to intersect AB at A'. 6. ∆A'BC' is the required triangle. Draw a right triangle in which the sides (other than the hypotenuse) are of lengths 4 cm and 3 cm. Now, construct another triangle whose sides are times the corresponding sides of the given triangle. 1. Draw AB = 4cm. 2. Draw RA perpendicular to AB, and mark C on it such that AC = 3 cm. 3. Join BC. DABC is the required triangle. 4. 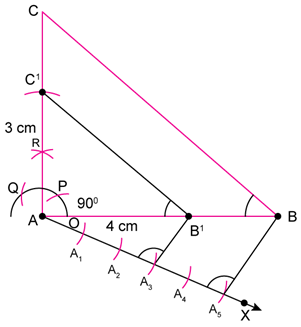 Draw any ray AX making acute angle ∠BAX with AB. 5. Mark five points A1, A2,…..,A5 on AX. 6. 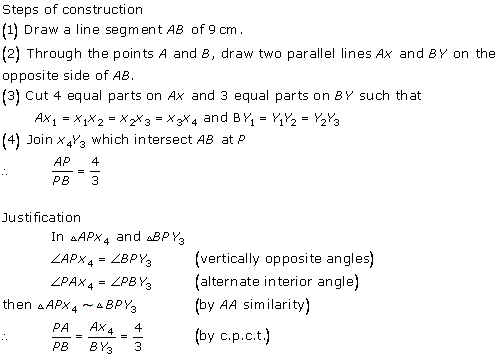 Join BA5, and draw a line parallel to it passing from A3, intersecting AB at B'. 7. Draw line parallel to CB through B' to intersect AC at C'. 8. ∆AB'C' is the required triangle. 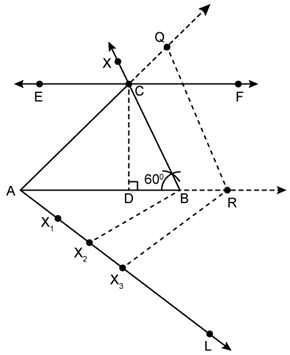 Construct a ∆ABC in which AB = 5 cm. ∠B = 60o altitude CD = 3 cm. Construct a ∆AQR similar to ∆ABC such that side of ∆AQR is 1.5 times that of the corresponding sides of ∆ACB. 1. Draw a line segment AB of length 5cm. 2. Taking B as a point,construct an angle of measure 60o using a compass. 3. Name the angle as angle ABX. 4. Draw a line EF at a height of 3 cm such that it is parallel to the line segment AB. It must intersect ray BX at point C. Now join AC. 5. Draw CD perpendicular to AB. CD is the altitude of ∆ABC having height 3cm. 6. ∆AQR is 1.5 times that of the corresponding sides of ∆ACB, i.e 3/2 times the corresponding sides of ∆ACB. 7. 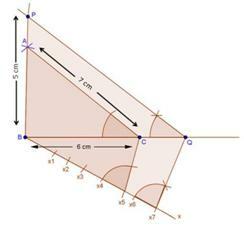 Draw any ray AL making acute angle ∠BAL with AB. 8. Mark three points X1, X2,X3 on AL. 9. Join BX2, and draw line parallel to it passing from X3, intersecting AB extended at R.
10. Draw line parallel to CB through R to intersect AC extended at Q. 11. ∆ARQ is the required triangle. Construct a traingle similar to a given XYZ with its sides equal to (3/4)th of the corresponding sides of XYZ. Write the steps of construction. 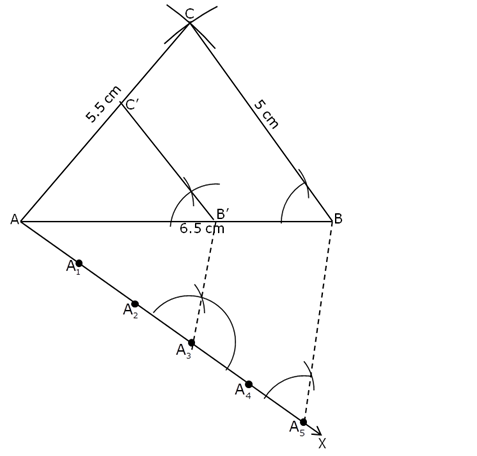 Construct a triangle with sides 5 cm, 5.5 cm and 6.5 cm. Now construct another triangle, whose sides are 3/5 times the corresponding sides of the given triangle. With A as the centre and radius AC = 5.5 cm, draw an arc. Join AC and BC to obtain ∆ABC. Below AB make an acute ∠BAX. Consider three parts out of five equal parts on AX. From point A3, draw A3B' ∥ A5B meeting AB at B' such that ∠AA5B = ∠AA3B'. Construct a ∆PQR with side QR = 7 cm, PQ = 6 cm and m∠PQR = 60°. 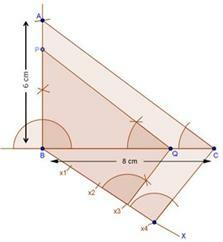 Then construct another triangle whose sides are 3/5 of the corresponding sides of ∆PQR. 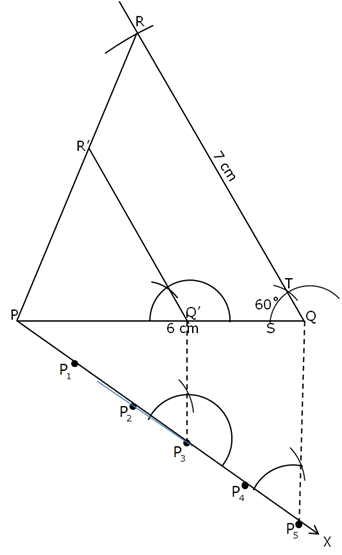 To construct ∠ PQR = 60°, taking Q as the centre and with an arbitrary radius draw an arc cutting PQ on S.
Taking S as the centre, and the same radius, draw an arc cutting the previous arc at T. Join Q and T, extend QT further. With Q as the centre and a radius of 7 cm, draw an arc on the extended line segment QT at R.
Join PR and QR to obtain ∆PQR. Below PQ make an acute angle QPX. Along PX, mark off five points as the sides of triangle to be 3/5th of original triangle, the sides to be divided into five equal parts. Mark P1, P2, P3, P4, P5 along PX, such that PP1 = P1P2 = P2P3 =P3P4 = P4P5. Draw two tangents to a circle of radius 3.5 cm from a point P at a distance of 6.2cm from its centre. Taking O as the centre, construct a circle of radius3.5 cm. Taking O and P as the centres, draw arcs of circles above and below OP intersecting each other at points R and S respectively. 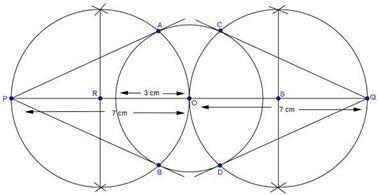 Draw the perpendicular bisector of OP by joining A and B. Mark the midpoint of OP as Q. Taking Q as the centre draw a circle of radius OQ or PQ and mark the points of intersection of the two circles as A and B. Join PA and extend it on both the sides. PA and PB are the required tangents. 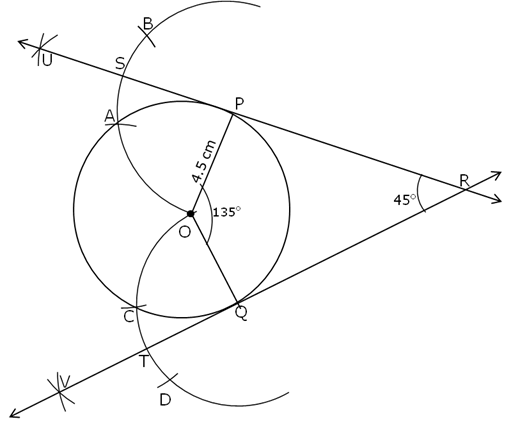 Draw a pair of tangents to a circle of radius 4.5 cm, which are inclined to each other at an angle of 45°. Draw a circle having a centre O and a radius of 4.5 cm. Take point P on the circle and join OP. Keeping a radius of 4.5 cm, draw arcs of circle taking the points P, and Q as the centres. Name the points of intersection of arcs and circle as A and C respectively. Taking A as the centre, and with the same radius mark B such that OA = AB. Similarly, taking C as the centre and with the same radius mark D such that OC = CD. Taking A and B as the centres and the same radius draw two arcs intersecting each other at U. Join P, S and U and extend it on both the sides to draw a tangent at point P.
Taking C and D as the centres and the same radius draw two arcs intersecting each other at V.
Join Q, T and V and extend it on both the sides to draw a tangent at point Q. Extended tangents at P and Q intersect at R.
Hence, the required tangents are UR and VR such that the angle between them is 45°. Draw a right ∆ABC in which AB = 6 cm, BC = 8 cm and m∠B = 90°. 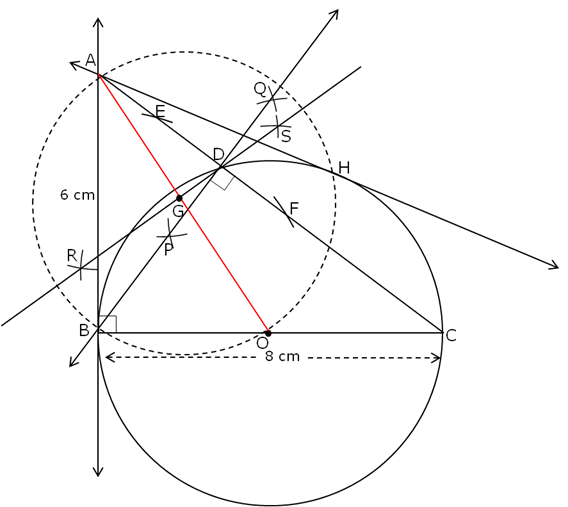 Draw BD perpendicular from B on AC and draw a circle passing through the points B, C and D. Construct tangents from A to this circle. Draw a line segment BC = 8 cm. Measure m∠B = 90˚ at point B. Join AC. Hence, ∆ABC right angled at B is constructed. 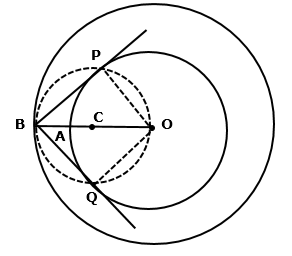 Taking B as the centre and a radius more than BD, draw two arcs cutting AC at points E and F.
Taking E and F as centres draw arcs to intersect each-other at P and Q respectively. Join and extend PQ on both the sides. This is the perpendicular BD from B on AC. 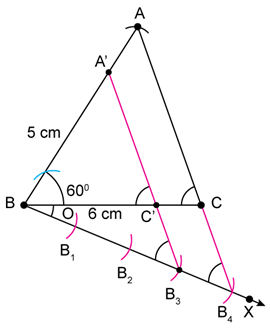 BD⊥CD, hence, ∆BCD is a right angled triangle. Therefore the circle passing through points B, C and D has the hypotenuse BC as the diameter. OB ⊥ AB, extend AB on both the sides. OB is one of the tangents passing through point A and tangent at point B. Join OA. Take the centre of OA by drawing intersecting arcs from point O and A and which intersect at points R and S respectively. Join RS. The point at which RS intersects OA is G.
Taking G as the centre and radius OG, construct a circle. The point of intersection of the two circles is H.
Join H and A. Now extend AH on both the sides. AH is the second tangent drawn from point A. 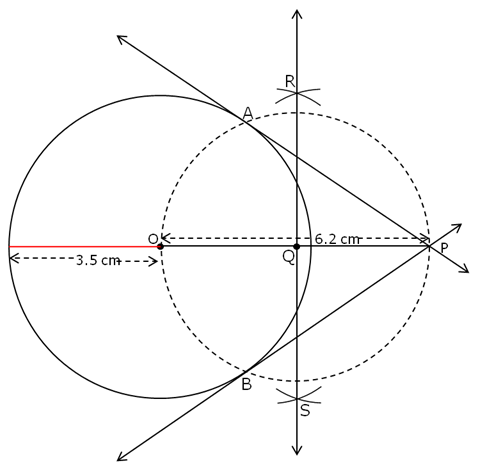 Draw two concentric circles of radii 3 cm and 5 cm. Construct a tangent to the smaller circle from a point on the larger circle. Also, measure its length.